A rounded, plasticky take on the iPad. 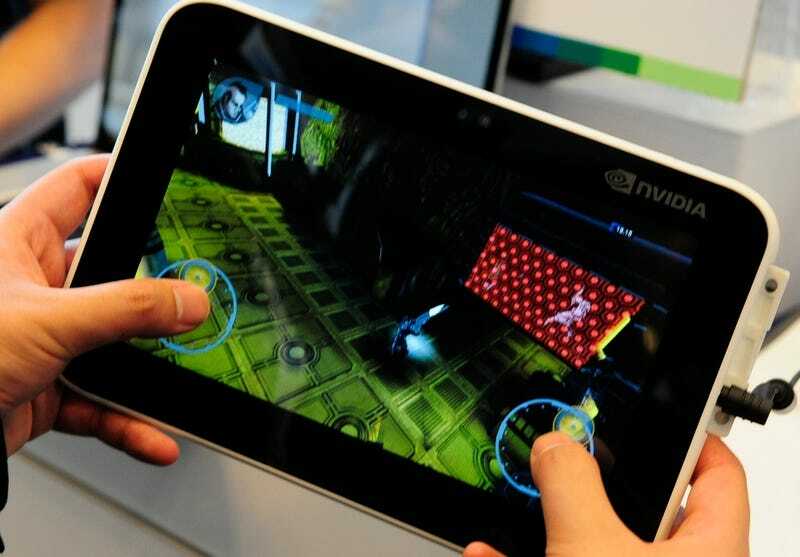 That's how Nvidia's latest Android tablet prototype struck me. It's pretty nice. But not as nice as the inside. Inside this 8.9-inch tablet, you see, is Nvidia's Tegra 2, the heart of which is a dual core ARM Cortex A9—a chip that's a generation ahead of the silicon the iPad's A4 is based on—meaning this thing will zooooom. It's also got a gig of RAM (the iPad's biggest technical limitation now is its puny amount of RAM), two USB ports, and a front-facing camera. Given that both of the units we handled were running just one app each—pretty snazzy looking games—it's hard to tell what it'll be like to use generally, like with the front-facing camera and how the widescreen aspect ratio feels outside of a game, but the games did feel and look great, as you'd expect from the kind of horsepower inside. I wish the screen, which is capacitive for multitouchness, wasn't quite as glossy as the iPad though. Oh well. None of the devs who had one at their disposal knew when the tablet would actually be coming out, only that it would, one day. It's no Adam, but it's like actually here, almost.